Eliminate the guess work to season long clear water in one easy package. 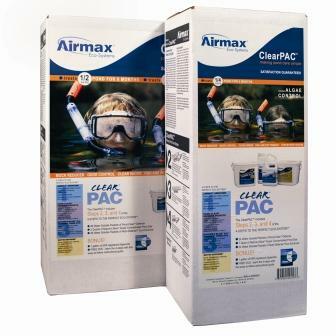 The ClearPac was designed to end the guesswork of creating and maintaining a healthy ecosystem. The ClearPac solves the issues that so many pond owners face such as: poor water quality, unwanted muck, fish health, and maintaining crystal clear water. or a 1/2 acre pond for 3 months. (1) quart Nature's Blue S.C.
To view .PDF instructions "Click Here"
Please Note: Algaecides cannot be shipped to: California, Connecticut, Maine, New Jersey, New York & Washington. If you live in these states, we have designed a Restricted Clear-Pac just for you!